Candy Bouquet International franchise business opportunity. 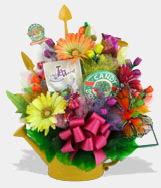 Free Candy Bouquet International, Inc business franchise information. Candy Bouquet arrangements are delicious gift alternatives to flowers and are perfect for special occasions or corporate gifts. Each arrangement can be created in any shape, size, color or theme. The candies are individually hand-wrapped on stems and made into one-of-a-kind gifts. Candy Bouquets won't wilt, fade or die. Training for Candy Bouquet takes place in <?xml:namespace prefix = st1 ns = "urn:schemas-microsoft-com:office:smarttags" />Little Rock, Arkansas. The sessions begin on Monday morning and end Friday afternoon. Each franchisee has the opportunity to familiarize themselves with CBI's Distribution Center and purchase from over 2,000 gourmet and specialty items in stock. To learn more about the Candy Bouquet franchise opportunity, simply complete the form below.